I met the Butlers for the first time at a hunting show in the U.S. Our paths crossed again at the 95thHeym invitational at the maker’s rifle factory in Germany in 2013. At this event I acted as translator between what was dubbed “Team America” and the predominantly Bavarian attendees. 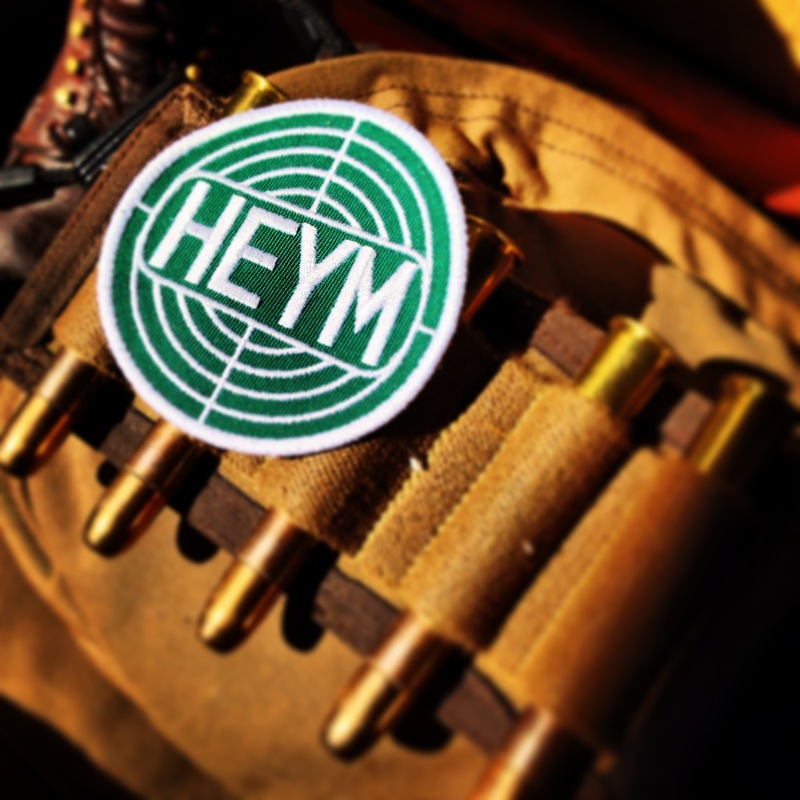 We spent hours touring the factory, choosing blanks of wood, visiting engravers in their cavernous-home workshops and – the most fun of all – shooting a variety of, and mostly large-caliber, Heym double rifles. 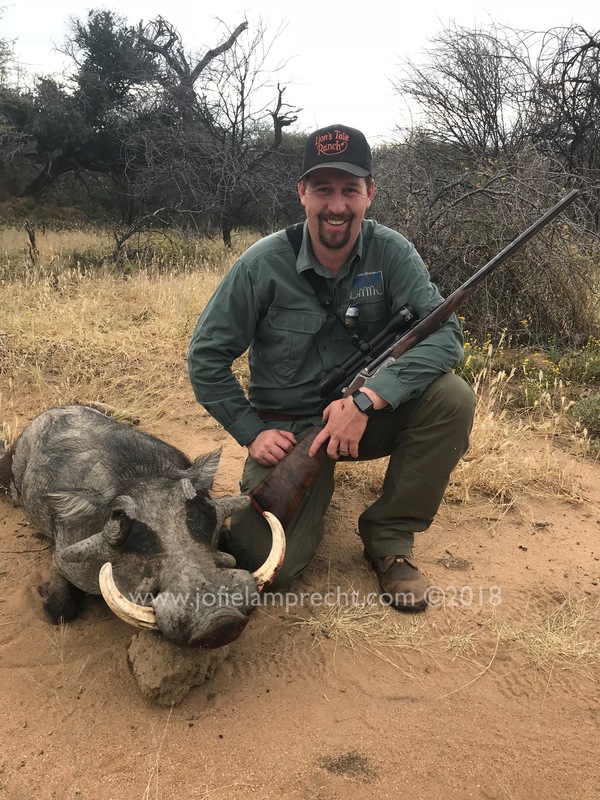 May 2018 found us hunting in cattle country, in the Waterberg area of Namibia. The thick bush below was shadowed by the 1000-foot-high red sandstone cliffs of the Waterberg plateau in the background. 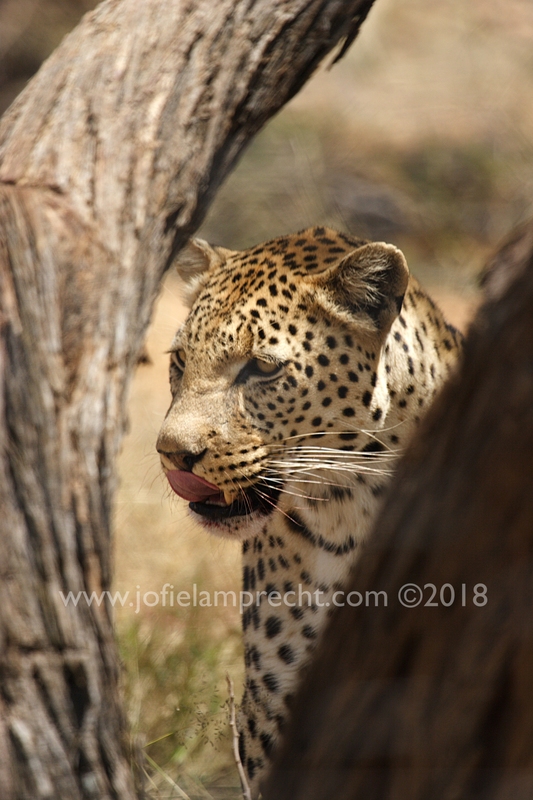 It’s one of the biggest privately owned cattle operations in Namibia where leopards are not persecuted because of their value for hunting, and there is a large and healthy free-ranging population. There is also an abundance of other game. Losses of cattle are tolerated, offset by hunters’ dollars. 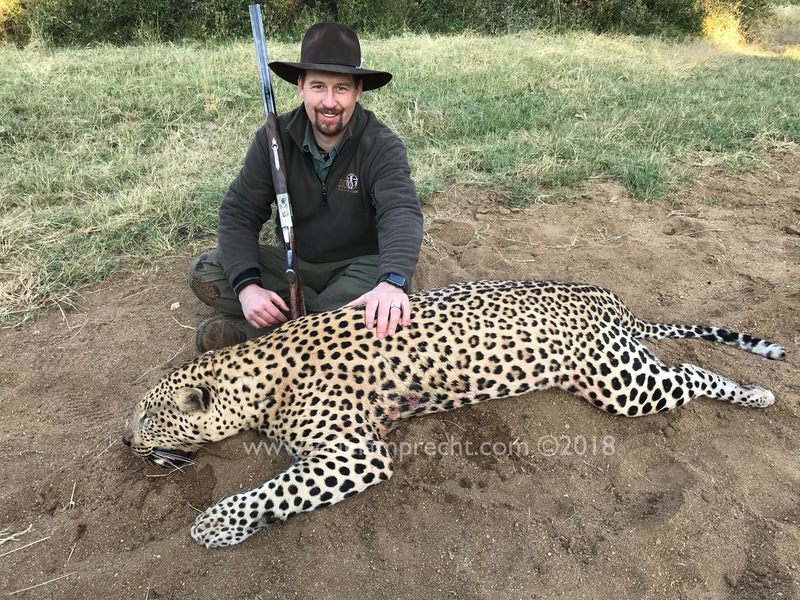 With a National Park as its eastern border, and a cat sanctuary which is also unfenced on the western border – this is the ideal place to hunt leopard legally in Namibia with some success. With the very restricted tag system in place in this country, sustainability is assured through controlled utilization. So there we are, Marc Butler and me in the late afternoon sun, sneaking a mile and a half to the leopard blind, when I realize I have left the tripod for the rifle in the truck. “Idiot!” I said to myself. We had several baits out and I wanted to make sure we had this stable shooting platform quickly available if we had another good cat on bait. I quickly went to get it, then headed back to Marc. 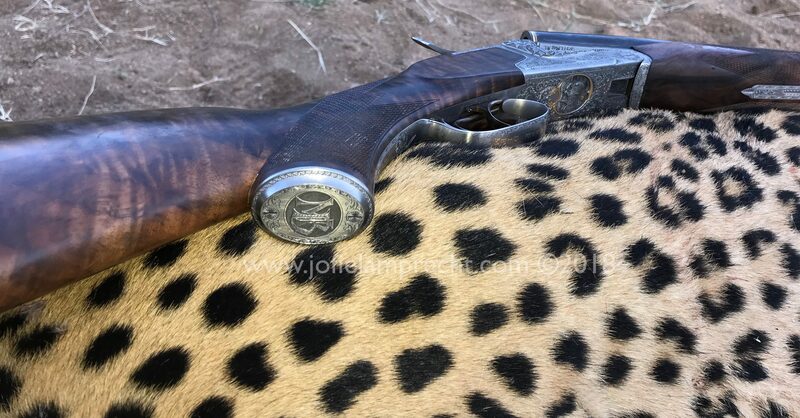 As I walked down the bush path, I saw Marc raise his double rifle and shoot, just 200 yards from the leopard blind. When I got there, “G” and Marc were not tensely following the trail of whatever it is they shot at, but casually walking through the bush with rifles slung over their shoulders. “G” as we affectionately call him, is our resident master-hunting-guide, full of local knowledge, and our pre-baiter who has a passion for leopard hunting. He’s a valuable asset to our hunting team. My fears subsided – they had shot at something that would not scratch them back too badly. Leaving the tripod in the road I followed them into the bush. The blood trail and spoor is obvious – warthog. After fifty yards I saw the pig, dead, with large .375 flanged wounds onhis flanks. But we already had plenty of bait. What the hell? Then I walked up close and saw what they had seen – a monster warthog boar. I shrugged. “It’s your hunt.” I had no better response. “G” and I dragged the trophy-worthy brute to the road, and iPhone pictures were hastily taken. We left the pig there for later collection and continued to the leopard blind. In the blind, our breathing calmed. Sweat dried. We buttoned down the last three air vents at about 17:00 – reading, listening to eBooks or napping. Pied babblers (an excitable bird that goes wild when anything is out of place) went wild close to the bait. 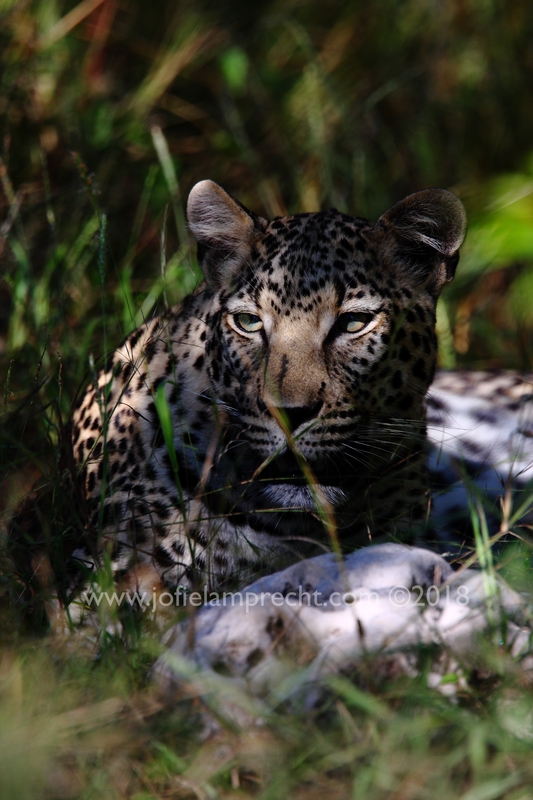 A minute later, like magic, a leopard appeared from the thick bush. The tension in the little blind increased by 200%. The sun still shone hot and bright in the late afternoon. Cautiously the elegant feline looked around and circled the shadowed tree. We hardly breathed. It was a small female. For 90 minutes we had the pleasure of watching her feeding, jumping a little, falling, resting, with ear-scratching and other catlike antics. As shooting light passed, we slowly left the blind after an exciting afternoon without sight of our big tom. Early waking at 3 a.m. came all too quickly. Coffee for me, a Coke for Marc. Our eyes were glued to the bright LED bar of light that cut our way open to the blind. By 4:30, after a walk in pitch-darkness with a sliver of new moon, we sat like an old couple, legs under blankets, huddled to keep warm behind the false safety of our blind. We waited. Around 5:30 we heard it. Heavy scratching and a labored climb as something cumbersomely made its way to our bait. Silence. Then the unmistakable sounds of ribs and other bones being crushed under heavy jaws. Slowly optics were raised to try and see through the veil of darkness. Marc strained through his scope. Nothing. Just blackness. For an hour of agonizing suspense, we could hear what we thought was our quarry, but could not see it. Just the cracking of bones assured us that there was still something, something substantial, in the tree. 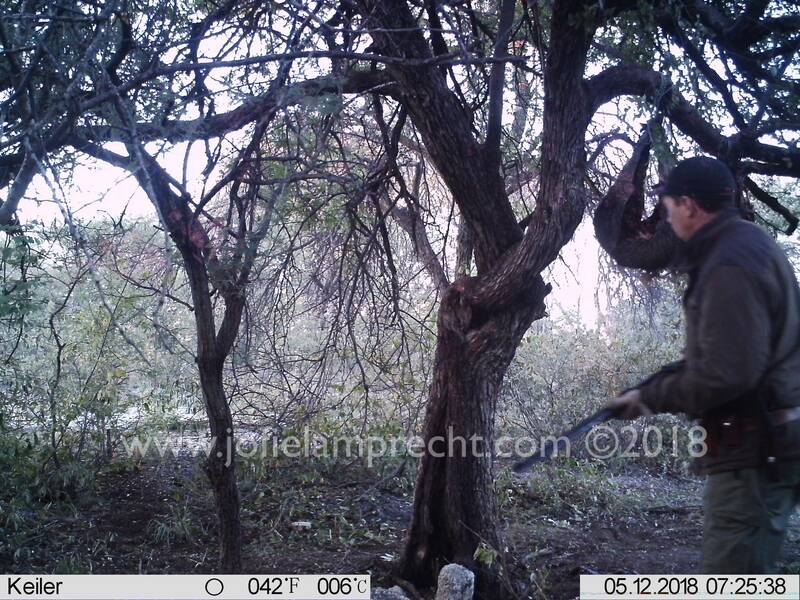 A female leopard jaw is not strong enough to break large bones; this is left to the males – or brown hyena in this area – but our bait was hung too high for hyena. With legal shooting light being 30 minutes before actual sunrise, (and in my opinion ethical actual shooting light only being 10 minutes after this), the minutes felt like hours. The birds’ chirping signaled the breaking of dawn, the francolin rejoicing having made it through the night, as the gray sky slowly lightened to pink. We waited. Minutes ticked slowly by. The slightest noise or mistake now meant failure. A bad shot could spell plenty of stitches. And then, like smoke, the leopard was out of the tree, and floated through the yellow-grey grass in front of the blind at an angle towards us. No shot. 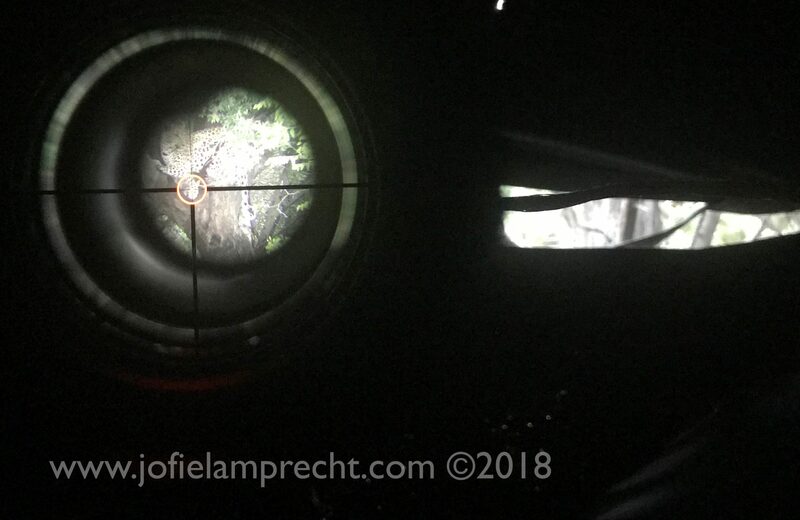 Our blind was perched on the bank of a small riverbed, a steep cliff and dry waterfall in front of us, with the bait tree, and now the leopard, on the top of the cliff. The leopard was separated by what is called the B.O.B. principal – bait, obstacle, blind. 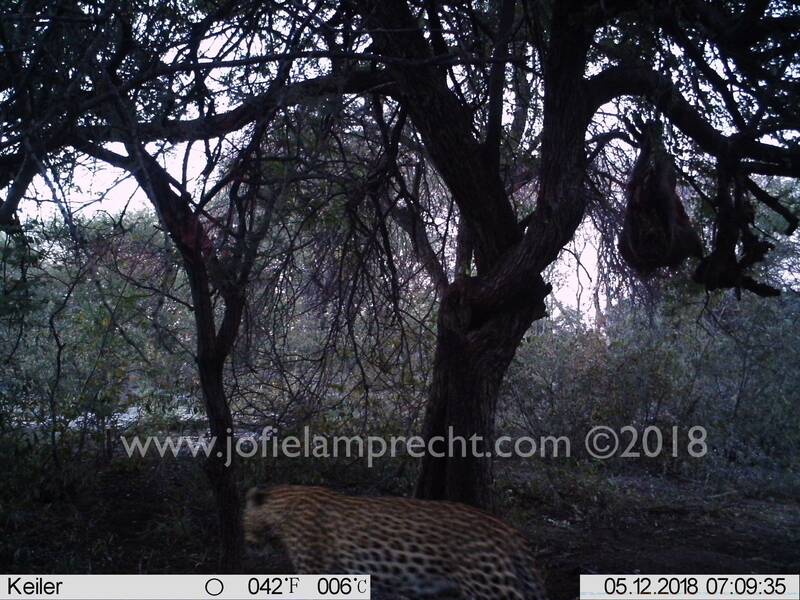 We were higher than the bait, and from my angle I had full view of the leopard below us. He walked slowly, tail sickled in the air – but there was something about his gait. He had a severe limp. Front left. Sore foot? Thorn? Fight? Who knew? We might never know. Marc was constrained by the blind, having just a peephole that his rifle was aiming through, with no way of moving the rifle’s barrel more than an inch. However, I had a full view of the leopard, now stretched out at 40 yards below our blind like the sphinx. There was the temptation to move the tripod, or to have Marc stand or crouch in the blind to try and get an unsteady shot off, but the consequences outweighed the thought. “Wait!” I silently mouthed to Marc. “WAIT!” Necks straining, eyes wide, it was hard to breathe. Sunrise was officially at 7:15. At 7:09 a mistake was made. The leopard’s. After rolling, lying on his back, stretching, yawning, scratching and doing everything a cat does, it was time for another helping of breakfast. The leopard suddenly got up and started walking. I put my hand on Marc leg, the contact like a shot of electricity. “Get ready.” We held our breath. The leopard rounded the tree and clambered up the rough bark to his feast. As he reached with one paw to pull the 200-pound warthog closer, he exposed his rosette flank. “Yes!” The tranquility of the morning was shattered. With a growl the leopard fell from the tree and disappeared into the dense bush. The thrill of the hunt, the resounding feeling of achievement seemed to reverberate in the blind. Silence. Wait. And then follow up. I took out my iPhone and started a timer with trembling fingers. We had 10 minutes. More light, more time for the bullet to have its effect. “Shot good?” Marc just nodded like a teenager having gotten his first love-letter from a pretty girl. (Dawn who he later married). As the light increased, I looked at the timer at least once a minute. Finally the time was up, and it was time to face the heat in this kitchen – time to clean up. With stiff legs and backs we got out of the blind, checked and rechecked our Heymrifles, Marc with his flanged .375 double, and me carrying a .300 Win. Mag. double. We edged across the river, atop the cliff towards the bait tree, looking for sign. Lung blood on a nearby raisin bush indicated the right direction. We followed, Marc and I flanking “G” who squatted and pointed. There, 40 yards away lay the leopard. It is experiences like these that draw us back to the bush; it is indeed what keeps some of us in it. The challenges, the low lows and the highest of highs. Where else in the world today does one get these pure feelings of euphoria? 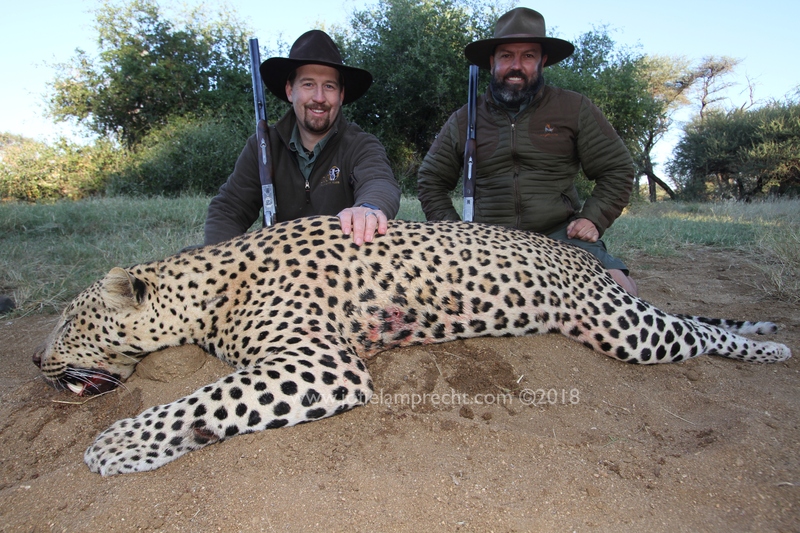 It is the privilege that we hunters have, in the seemingly selfish pursuit of our passion, of saving Africa’s wildlife with a value-for-value system that protects free-ranging populations of Africa’s wildlife. Husband. Father. Big Game PH. Photographer. Writer. Jack Russell Lover. 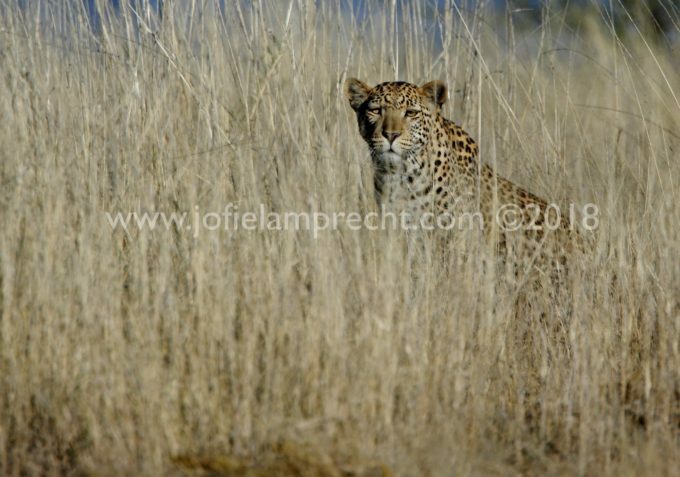 Born in Namibia 1979, Jofie was raised on safari. Hunting his first Oryx at 5, first leopard blind at 6 and took his first cape buffalo when just 12. He is proud to uphold the traditions of ethical and fair-chase hunting. Based in the suburbs of Windhoek, with his beautiful wife Maryke, their daughter Rachel, baby Jofie, Jack Russell Terrier and two cats. Wonderful narrative of obviously a memorable hunt!